Dissertation: "Influence of Cinema on Literature"
Professor Dodona Kiziria is known for her rare combination of extraordinary talents and unique abilities, which distinguish her from all of the other members of our Department of Slavic Languages and Literatures. 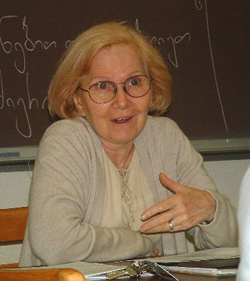 She has demonstrated her outstanding talents in her teaching and lecturing, her work on the Georgian language (her native language), and in the fields of Russian and East European literature and cinema. Each of these fields represents an important aspect of our colleague Dodona Kiziria, who is now retiring after a productive career as student, lecturer, and professor in the IU Slavic department. Dodona’s teaching has to be experienced to be believed. I thought I knew about it after reading dozens of testimonials from students and others as part of the process of compiling her tenure dossier, back in the 1980s. I knew that she was well-known for her teaching skills at Indiana University, and that she had won the prestigious Frederic Bachman Lieber Memorial Award in 1985, for which a plaque is on permanent display at the IMU. Yet I had not experienced her teaching for myself, until I attended a lecture she gave on her native Georgia, during one of the lectures in our Summer Workshop in Slavic, East European, and Central Asian Languages. Dodona Kiziria held the audience spellbound for the entire period. And she finished the lecture with the unexpected, yet dramatically appropriate gesture of pouring a glass of wine and toasting the audience. I suddenly realized that I had been a witness to a truly remarkable presentation, and it became clear that Dodona’s fame as a lecturer was not just due to her vast knowledge of certain subjects, such as Georgia. Rather, it seemed to be a matter of an innate talent in the timing of words and actions, to hold the listeners captivated, much as an accomplished stage actress might. Her file overflows with letters from students who sincerely tell us how Dodona’s teaching has changed their lives and given them a new perspective on learning. She has fulfilled her teaching mission in such an indelible and unforgettable way that our department will always take pride in this accomplishment. Her uniqueness in the field of teaching is so legendary that many students have been flocking to her classes in this, the year of her retirement, in order to experience her teaching at least once. The field of Georgian is another major pillar of Dodona Kiziria’s knowledge and persona. The author of Georgian grammars and textbooks, as well as an important Georgian-language poet in her own right, Dodona has single-handedly put our department on the map in this field as well. Her renown in the Georgian field extends far beyond IU, however, and she has set up or worked on Georgian-related programs for the U.S. State Department, Yale University, and Duke University, to name just a few. Although her Russian literature and cinema courses rarely permit her to offer Georgian during the fall and spring semesters at IU, she has regularly taught the Georgian language in our Summer Workshop, aided by her brother and niece, who specially fly to Bloomington to perform this important task. Since the status of Georgian evolved from a language of just one Soviet republic to a critical language of an independent state, its international importance has risen dramatically, and now the Georgian language is a mainstay of our summer offerings. This must be a great source of pride to Dodona, since she has long served as unofficial ambassador and interpreter of things Georgian. Anyone in our department would immediately think of her culinary abilities in the preparation of the famous Georgian cheese bread khachapuri, which Dodona often contributes to departmental receptions, where it always has the distinction of being the most eagerly awaited dish, and the first to be devoured by its many faculty and student devotees. In addition to Dodona’s vast storehouse of skills in teaching the Georgian language and representing its culture among us, mention should be made of her distinction as a Georgian poet. Legend has it that one of our colleagues once dropped the name of Dodona Kiziria in Tbilisi, Georgia’s capital, and was immediately treated to an impromptu recitation of her poetry. Another colleague reports seeing a full-page Tbilisi newspaper article on Georgian poets, with Dodona Kiziria’s portrait in the key central position on the page. Me minda davlio sadgerdzelo chveni dzvirpasi Dodonasi, romelsac chven dges pativs vscemt. Dodonas gaumarjos! Idgerdzelos da ibednieros chvenma dzvirfasma kolegam Dodonam, Dodona, sul kargad da janmrtelad gveq’olet! I want to drink a toast to our dear Dodona, whom we are honoring today. May Dodona be victorious! May our dear colleague Dodona live long and be happy. Dodona, be well and healthy! 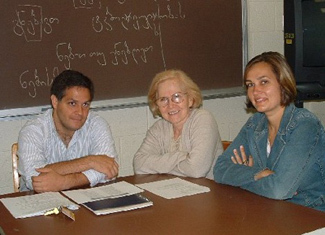 Professor Dodona Kiziria teaches Beginning Georgian at SWSEEL (Summer Workshop in Slavic, East European and Central Asian Languages) Indiana University. She is also a full-time professor at IU, where she has been teaching since the 1970s. Her courses include Russian and Soviet Film, Central European Cinema, and courses on Russian literature and Georgian language. During SWSEEL, Professor Kiziria presented lectures on "The New Georgia" and also on Russian and East European film. In her native country of Georgia, Professor Kiziria is known for the poems that she has published in her native language. The collapse of the Soviet system and the on going process of globalization of the world economy have created a paradoxical situation concerning human rights in the republics of the former Soviet Union. In the countries of the former Soviet Republics human rights are abused on a larger scale and with greater impunity than at any time since the end of the so-called Stalin era. Individuals and whole ethnic communities whose rights are being abused have less and less hope for any justice or even moral support from international communities. Human rights organizations are becoming increasingly ineffective in their attempts to influence public opinion or government policies concerning human rights. The West and the United States, who until a short time ago were seen as the harbingers of human rights and democracy in the world, are becoming more and more tolerant towards the unprecedented abuses of human rights in the newly independent states. There are three major factors contributing to this regrettable decline of a movement that occupied a prominent place on the agenda of many international political organizations, social groups, and even government offices. A. During the last decade it has become increasingly obvious that presence or absence of atomic power in possession of any given government determines the degree of indignation that the Western powers are ready to express over human rights abuses by this government. The Western alliance and the US did not hesitate long to use military force in order to stop the Serbian atrocities in Kosovo. However, they do not want to go beyond feeble protests to the Putin government, which is conducting a virtual genocide of the Chechen nation, and using most barbaric methods to achieve its goal. The Western leniency towards Moscow is having extremely negative consequences that are affecting the problem of human rights. The actions of the West have discredited their good intentions and turned their claims in the name of human rights into hypocrisy. These double standards are provoking more and more countries to become atomic powers in order to forestall any military interference in their internal affairs on the part of existing or possible future alliances. Iraq, Iran, China, India, and Pakistan are intensifying their efforts to become full-fledged atomic powers, and thus render themselves immune to any outside interference into their internal affairs. B. It has become increasingly obvious that the economic interests of the Western powers supersede moral or humanitarian concerns. The Western alliance and the US used military force to liberate Kuwait in the name of freedom and justice, but are conducting business as usual with Russia and China at a time when human rights abuses have reached staggering proportions in both of these countries. The supremacy of economic interests in determining the foreign policy of the Western powers has many deplorable consequences. The governments of many smaller countries that are not blessed by fate with rich oil fields, are trying to gain the support of the West by offering every possible economic incentive to Western investors; they are turning their territories into an unrestricted market for imported goods or into a source of raw materials without regard for the disastrous ecological consequences and the depletion of natural resources. This too has an adverse effect on human rights since it is corrupt governments and the Mafia who benefit from such deals, while the majority of the people live in abject poverty, often unable to enjoy even the absolute minimum of civil rights. Another bait, smaller countries use to make themselves attractive to great powers, is their geopolitical advantages. Thus, Armenia, in exchange for Russia's military aid, has turned almost its entire territory into Russian military base. As an afterthought, I would like to add that the economic factor seems to be a much more compelling factor in determining the policy of the Western alliance and the US. Russia's nuclear arsenal was not created after the dissolution of the USSR, it has been building up for the last forty years. However, its presence did not deter the West from speaking up in defense of human rights in the republics of the former Soviet Union in the past. C. Economic interests are inseparable from the strategic concerns of superpowers or powers aspiring to become such. Russia and the United States offer their support to smaller countries, albeit with a heavy price tag attached. And governments willing to pay such price, enjoy full immunity from any responsibility for human rights abuses in their countries. Georgia provides an excellent illustration. In pursuit of its economic and strategic interests, the US chose Shevardnadze just as it had chosen Shah Reza Pahlavi in Iran, President Marcos in the Philippines, and just as it made its choices in Vietnam, Guatemala and El Salvador. And, having made its choice, it sees no evil, hears no evil, speaks no evil about its protegees. The US administration continues to turn a blind eye to abuses of power by the Georgian government, abuses of human rights throughout the country, torture and atrocities in prisons, discrimination against persons known to be in opposition to the present government or suspected to be sympathizers of the late President Gamsakhurdia. Political prisoners who have suffered physical pain and humiliation, who have been serving long prison terms under unbearable conditions are declared to be hardened criminals. In this regard, the cases of Dokvadze, Gelbakhiani and numerous others have been well documented by various international human rights organizations, but Washington prefers to ignore them. With depressing regularity the US administration keeps praising Shevardnadze, awarding him all sorts of medals, especially at times when his popularity in Georgia plunges dangerously low. A significant number of Georgians live abroad against their will for fear of imprisonment on charges of being Zviadists. The US government twice denied an entry visa to Konstantine Gamsakhurdia, whose only "crime" is being a son of President Gamsakhurdia. Last year in the annual report released on its web site the State Department of the US listed Georgia among the countries sponsoring terrorism, and named supporters of Zviad Gamsakhurdia as the worst offenders. Moreover, in violation of the democratic principle of "innocent until proven guilty", an individual who is still under investigation on terrorist charges is cited as a terrorist. Ironically, according to numerous statements by President Shevardnadze himself, at least three supposed terrorist actions against him were planned or carried out by persons who were once close to him and even served as members of his government. The US and other Western observers, with the exception of the Helsinki Human Rights Organization, declared the parliamentary elections last October to be just and democratic in spite of unprecedented abuses in favor of the ruling Citizens Party and clearly biased election laws adopted by the Georgian government. Echoing official reports of the Georgian government they emphasized voting irregularities in Adjaria, but never mentioned that the candidates of the Agordzineba party were beaten, prevented from entering the building they had rented, and had their cars blocked in order to deny them access to their electorate. Moreover, the election video advertisements of the Citizens party portrayed the representatives of the Agordzineba as a "Muslim threat", a "dark force" which would destroy Georgia. President Shevardnadze was officially blessed as the "only hope" for Georgia in Svetitskhoveli, the largest cathedral of the country. Fuelling ethnic and religious hatred, these actions violated the Constitution of the country. These are just a few examples of the US policy towards human rights abuses in Georgia. In view of the above-mentioned developments in the post-Soviet world, human rights organizations face particularly difficult challenges in carrying out their mission. Unless international human rights organizations develop new strategies and find new, more effective methods the very concept of human rights may become an obsolete and romantic indulgence of the century that is nearing its close. The Author: Dodona Kiziria is professor of literature and movie research in the University of Indiana, US. She is Georgian by birth and an expert of the development of post-Soviet Georgia.